Our wanderings have taken us to this man made water “feature”. Yet another wonder carved by the mighty Colorado River, halted by man’s dam at the right spot, and then back filled by the Colorado to where it embraces 1900 miles of shoreline. What a place. Something that has been on my bucket list since we lived in Denver in the 70’s. Thanks to Vilia, we finally made it! 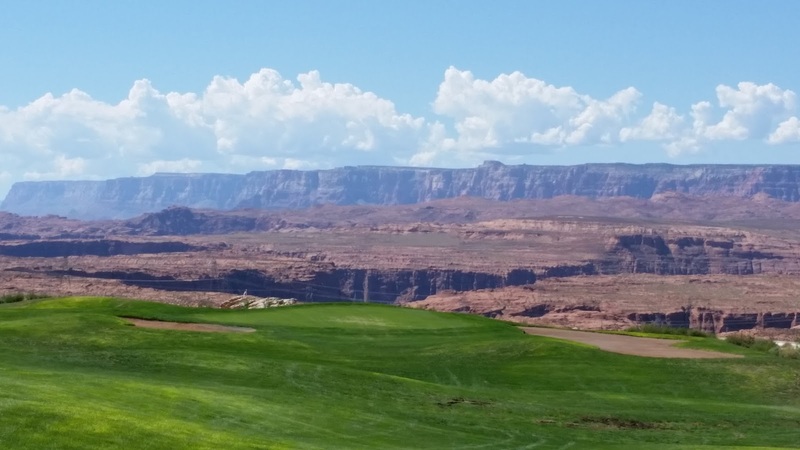 We have been graced with a very scenic campsite that is on the outside edge of the campground and has open views of a portion of this lake and the red, pink, white and grey cliffs off to the distance. We lucked out. 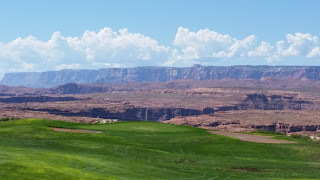 I played golf yesterday at Lake Powell National and Cathy went to the nearby access beach. The water is 80 degrees and clear and beautiful she reports. 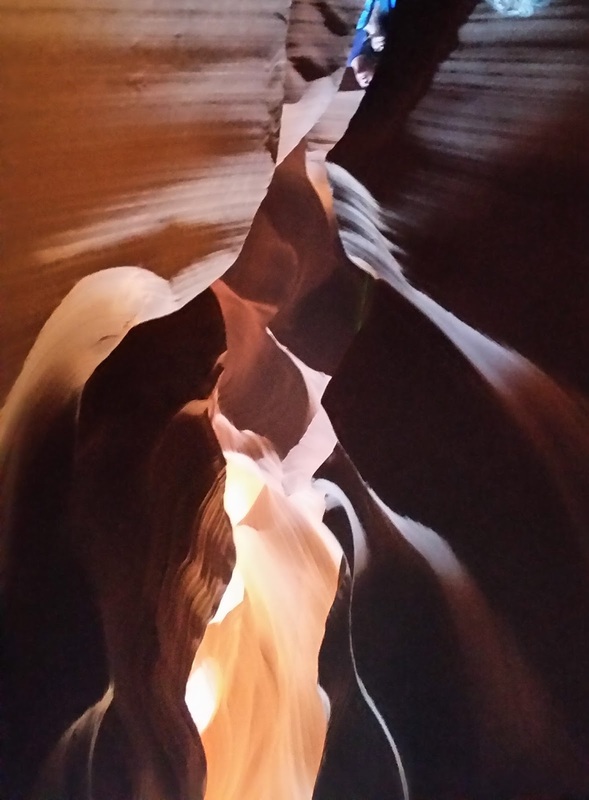 Today we took a tour, (the only way to access), to nearby Antelope Canyon. 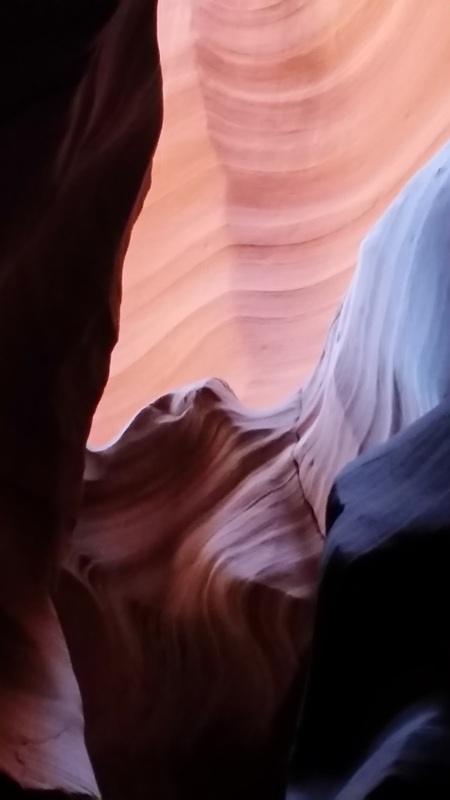 It is a slot, (narrow), canyon that was created some billion years ago when under water in what was a sea, before the earth’s plates moved together to make California rise up with the rest of the US west. My pics are weak compared to what you will see from Cathy’s camera eye, but I post to show the water flow lines in the sandstone, and just a taste of the color. Our Guide was a very noble young Navajo man whose Grandmother was the first to document, in written word, the existence of the Antelope Canyon. It was known by word of mouth for many decades before. He was great as a guide with much good info. We stopped at one photo spot where there is a rock image somewhat recognizable as a profile of Abe Lincoln. I asked him if there was a Navajo name that might have been used before Lincoln’s time for the facial profile. He said he did not know but went on to say that Lincoln was no friend to the Navajo. Lincoln was president when the Navajo were banished in what is known as The Long Walk, to parts away from this land, for intended government takeover of their homeland. After hearing the story, I could only come back with the comment, “I’m glad you got it back”. It is a rare story in the history of our country and our treatment of the native peoples. The Navajo do not do the casino thing and there is no alcohol available within the Nation. These are people that embrace their ancestry yet can live with it within American society. They are wonderful to spend time with. Wow. Every entry is more wow-ing than the last.